How much finer things are in composition than alone. ‘Tis wise in man to make Cabinets.” On experiencing the multiple cabinets and gardens in the Jardin des plantes in 1833 Ralph Waldo Emerson was struck by the pleasing affect the compositional structure had on him. Gaitkrash created this first signature piece in 2006 as a way of finding their particular way of working at the intersection between theatre, sound art and fine art. 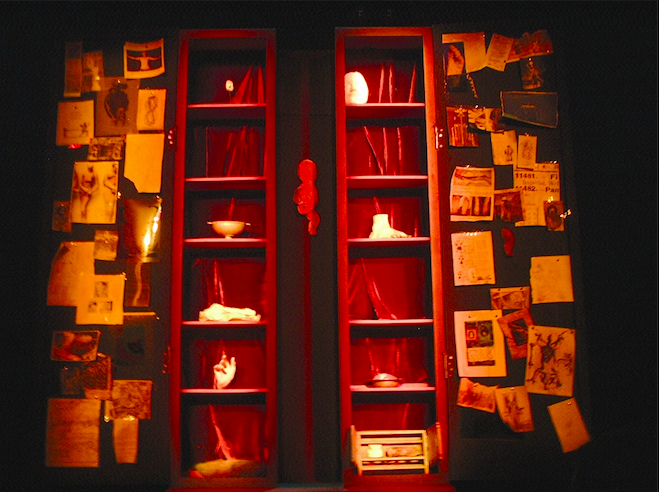 Objects are performed from behind a backless wooden cabinet consisting of 12 individually lit ‘mini-stages’, complete with individual pairs of red velvet curtains. 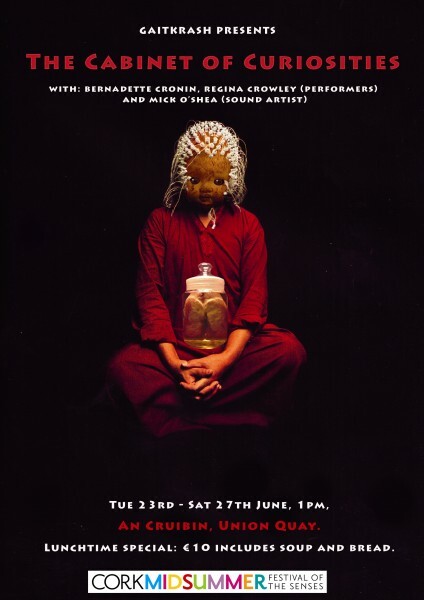 The ‘objects’ can include organic and inorganic objects, body parts, organs (from animals), words and text fragments. 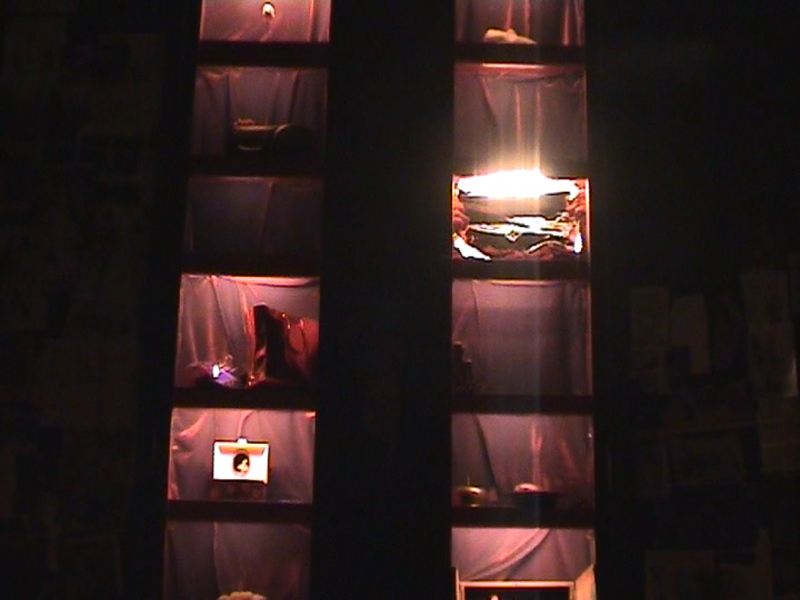 The sound/artist is positioned with his table of self-designed instruments so that he can dialogue in the moment with the visual images the performers offer him and the performers in turn respond to the sound images. Some of the starting points for this ‘conversation’ were the body: the questioning of ideas of inside and outside, the body as an envelope, body parts as puppets; paintings by Francis Bacon, and 19th century dissection practices. While the performers work with individual scores in performance, the emphases are on non-narrative-based performance of objects, liveness of the conversation in the moment and the freedom of the spectator to create her/his own ‘objects’ with what emerges in performance. ‘Yet the interventions are becoming more obvious. Director, author and teacher Phillip Zarrilli was in Cork to meet Gaitkrash with a view to a production for the 2010 festival. The potential fruitfulness of such an arrangement was made excitingly obvious by the company’s work this year. 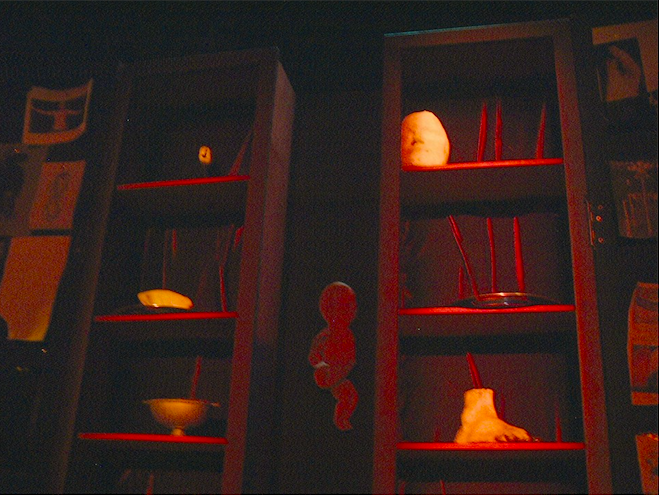 The Cabinet of Curiousities mounted raw, calcified or bottled anatomical specimens in tallboy alcoves, with each dead item manipulated by living hands and those in turn posing in slow, questing gestures, arranging a liver on a butcher’s hook or else opening on an unfolding crimson rose. The voiceless theme is probably a take on the 18th- and 19th-century pseudo-scientific vogue, but it is a developed theme, worked with precision by Regina Crowley and Bernadette Cronin and scored with equal care by sound artist Mick O’Shea.